Chef Jose Fernandez’s work day begins with greeting and shaking hands with every member of his team. 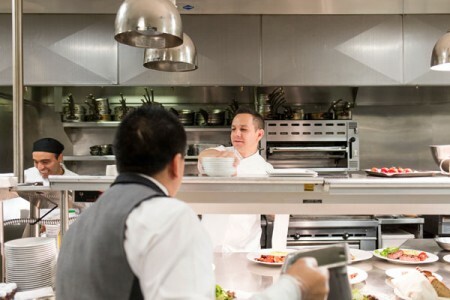 At points throughout the day, the chef must attend meetings and meet guests, but the bulk of his time is spent in the hotel’s several kitchens—cooking, teaching, and enhancing the menus with new flavors and innovative dishes. Fernandez is responsible for overseeing the entirety of culinary operations in the hotel—from its three restaurants (Shanghai Terrace, the Lobby, and Pierrot Gourmet) to banquets, the pastry kitchen, the bar, and the twenty-four-hour room service. To create the menus for each, he takes into consideration the appearance and ambiance of each space. Chef Fernandez is a graduate of the Culinary School in Barcelona, Spain. Upon moving to the US, he served as garde manger chef under Maître Cuisinier de France, Jacques Sorci, at the Ritz-Carlton Battery Park in New York. Fernandez was then on the opening team for the Ritz-Carlton, Dove Mountain in Tucson, Arizona, and was named executive chef for the Ritz-Carlton, Pentagon City. For Shanghai Terrace, named the best Chinese restaurant in the city of Chicago by Zagat, Fernandez found inspiration in Cantonese cuisine. “Most dishes are meant to be shared, and the restaurant features a 1930s supper club decor,” he says. Culinary globetrotters can enjoy European-style entrées by choosing to dine at Pierrot Gourmet, a café and bistro with a distinct Parisian flair. Room service at the Peninsula has also developed its own identity. Chef Fernandez has made it possible for guests to enjoy a memorable dining experience in the privacy of their rooms. Originally from Barcelona, Chef Fernandez admits that he loves to eat at the small tapas restaurants that are tucked into practically every corner of his native city. Though a cosmopolitan chef, Fernandez has stayed close to his roots. One of his favorite dishes is a classic Spanish paella, or fideua, as its Catalán version is called. The Peninsula Hotel, with its premier setting in the heart of downtown Chicago, is a perfect venue to host meetings, conferences, and popularly, weddings. The hotel has received the Forbes Five Star and the AAA Five Diamond Award every year since its opening and offers everything from an on-site team of event planners to state-of-the-art audio and visual equipment. A personalized menu can be designed around a theme, season, or regional cuisine to add a special touch to any event.